I love coffee. I'll admit it, I may even be a little addicted. That's why I was so excited for the opportunity to try fresh roasted coffee beans from Stumptown Coffee Roasters, a Portland-based company that sources the best coffees in the world. I received a 12 oz bag of Hair Bender coffee, which is a complex blend featuring coffee from all three of the major growing regions: Latin America, East Africa and Indonesia. It is described on the Stumptown website as a "sweet and savory blend which yields flavors of milk chocolate, caramel, jasmine, meyer lemon, apricot and pineapple." From my own experience, the coffee tastes exactly like its description; It is nice and strong, yet has subtle sweet notes, giving it the perfect taste. I really enjoyed the slight chocolate and fruity flavors of this coffee. Not only does this blend of coffee taste great, but it was fresh as can be. The batch was roasted literally a day or so before it arrived at my door, and I believe that the freshness makes all the difference in great-tasting, quality coffee. After trying Hair Bender coffee from Stumptown, the canned coffee we drink at work just doesn't compare... Looks like my coffee addiction just leveled up! 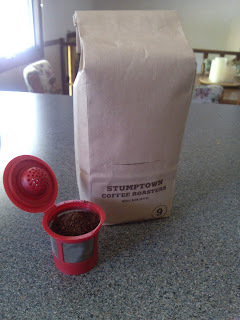 If you're looking to try something new, I highly recommend trying one of the unique fresh-roasted coffee blends offered by Stumptown Coffee Roasters. You can choose from whole beans or different styles of pre-ground coffee based on how you brew it. (I received French Press #9 pre-ground beans that work in my K-cup filter for the Keurig.) 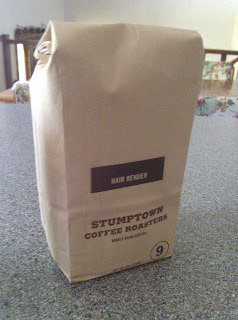 Buy online, or find Stumptown Coffee Roasters locations in Portland, Seattle, and New York. Disclaimer: I was provided this product free of charge for the purpose of this review. All opinions are my own. No other compensation was given.